Arid and semi-arid growing conditions characterize West Texas, which includes the Trans Pecos region and parts of the Edwards Plateau. Shallow soils with alkaline pH, hot summers and mild winters require planting flowers that conserve water and amending the native soil to improve the nutrients available to plants. West Texas flower gardeners can learn the types of flowering plants to select by studying the characteristics of native plants that grow in the area such as sage, flowering cacti, butterfly weed, daisies and coreopsis. Use graph paper to design the bed before purchasing plants. Incorporate plants that flower at different times and offer variations in color and texture. If your bed is against a fixed structure such as a building or wall, place the larger plants to the back of the designed area. If your bed is in an open area, place taller-growing plants in the center and surround them with shorter plants. Add fixed features to the design such as decorative rocks or fountains to create a landscape area. Prepare the site. Clear the top soil away from the planting bed with a shovel and remove rocks. Check soil drainage by digging a one-foot deep hole and filling it with water. If the water has not drained in an hour, dig deeper and check for caliche—a concrete hard white calcium carbonate layer that plant roots cannot penetrate. If your site has a caliche layer, break it up with a pick or iron digging bar before adding compost or planting. Add a layer of compost or organic material to the bed and backfill with top soil. The organic material provides nutrients to the plants and helps retain moisture. Unless the soil is extremely poor, a shallow layer of compost is sufficient because you are selecting plants adapted to your growing conditions. 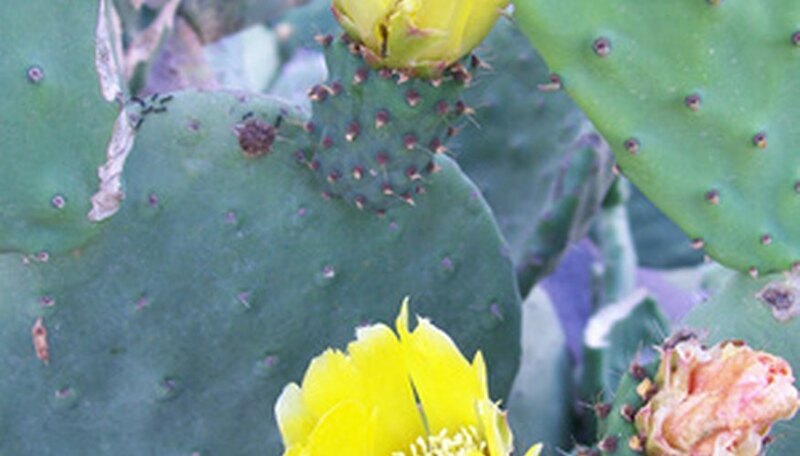 Select container grown flowering plants that are adapted to West Texas growing conditions. Purchase perennial plants in the fall to give them time to become established before summer heat. Because you will be planting at a depth equal to the level of soil in the container, select plants grown in one-gallon containers that are easier to work with than plants from three or five gallon containers. Dig a planting hole to the depth of soil in the container and approximately twice the diameter. Gently remove the flower plant from its container, untangle matted roots, and set into the hole. Add soil around the plant base and pack gently to remove air pockets. Add mulch around the plant base to retain moisture. Water the plant with a slow soaking making sure the entire root ball is moistened. Set up a soaker hose or drip irrigation system and water the plants weekly until they are established. In winter, watering may be reduced to twice monthly, returning to weekly watering during the summer.